London is full of interest, but where does it end and begin? The capital’s edges are ragged, a straggly series of fizzling out suburbs and streets on the fringes of the Green Belt, sometimes escaping the London Orbital, at other times giving way to fields surprisingly early. Take the Northern Line to its north-eastern edges at High Barnet or, better still, Mill Hill East and you’ll see the countryside unfold around you. It’s a trip to the countryside for a bleep of an Oyster card. Where it begins is only slightly easier to answer. Most schoolchildren, or at least those who’ve spent time on long car journeys, will tell you that distances to and from London are measured from Charing Cross, but what does this mean? After all, there have been roads and measurements from London for longer than there have been railways. The answer is, of course, that the Charing Cross in question is not the station, but the cross itself. Edward I’s crosses, erected across England as a memorial to his beloved wife, plotted a route that terminated at Westminster Abbey. The last was at the then-hamlet of Charing, a pit stop for merchants, aristocrats and pilgrims moving from London to Westminster. Various sources suggest the explanation of the name Charing as deriving from Cher Reine (Dear Queen) is a misnomer, and that Charing more likely comes from Cerring, an Anglo-Saxon word meaning bend. A cross stood here until 1647, when it was torn down by iconoclastic Puritans. And it was from this point that distances were measured. 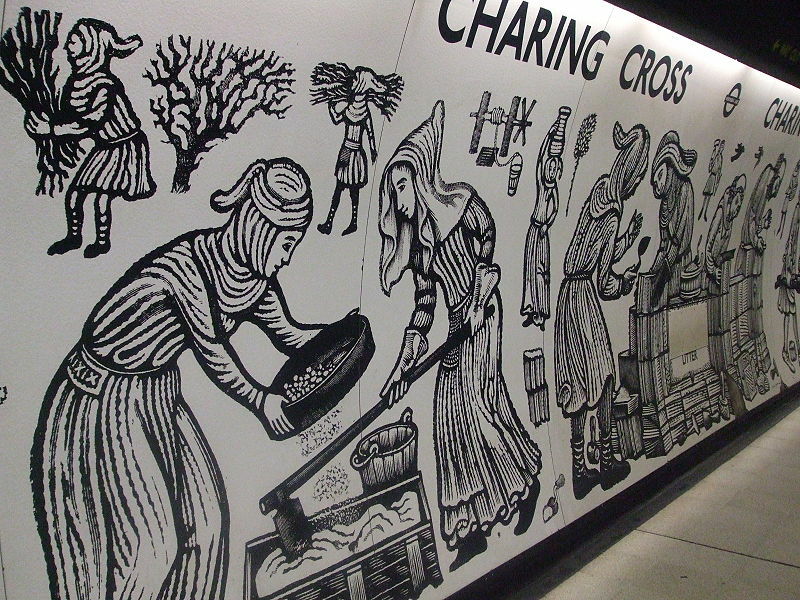 The lovely mural on the Northern Line platforms of Charing Cross Station by David Gentleman depict the construction of the cross. The Victorians, being well-intentioned and aware of their past, built a fine and over-large reconstruction of the Charing Cross which still stands in the forecourt of the station. It was designed by E.M. Barry who also came up with the plans for Charing Cross station. Stop and have a look when you’re next passing – it’s remarkably easy to miss despite its size, with taxis and London traffic roaring past. This cross, however, is not in the original location. By the time they got round to building the reconstruction another memorial to another monarch was in situ where Charing Cross stood. It’s still there, in fact: the equestrian statue of Charles I, guarding the entrance to Trafalgar Square from Whitehall. 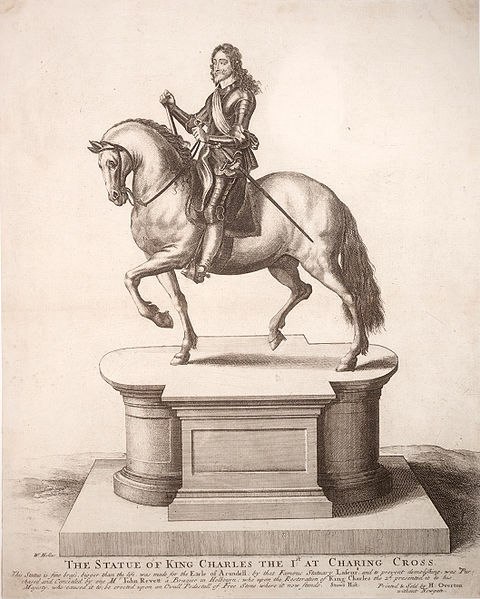 Charles I’s statue pre-dates Trafalgar Square and was built in 1675, standing in the Royal Mews. Today it feels very much like the centre of London, surrounded by honking traffic and overlooked by Nelson’s Column, the National Gallery and facing down Whitehall to Parliament. However, if that same schoolboy who is passing time on long car journeys gets the map out and follows older roads from their inter-city origins through the M25, the circular roads and the old Ring Road deep into the heart of London he will discover something. Rather than stop at Charing Cross the A1 starts and finishes at London Wall. The A2 will come to rest in Borough, while the A3 and the A10, the old Cambridge Road, both terminate at the northern end of London Bridge, at the junction of Cannon Street and King William Street, the A3 crossing London Bridge to do so. 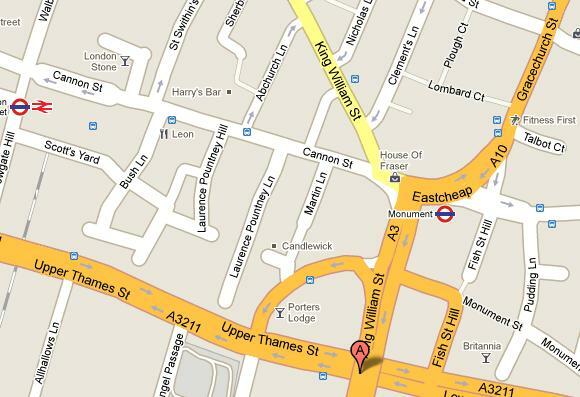 Why do these roads reach their end at the junction of Cannon Street and King William Street? The answer is to be found on Cannon Street – once called Candlewick Street – in an innocuous-looking window behind a painted grille. Here is a chunk of ancient rock. 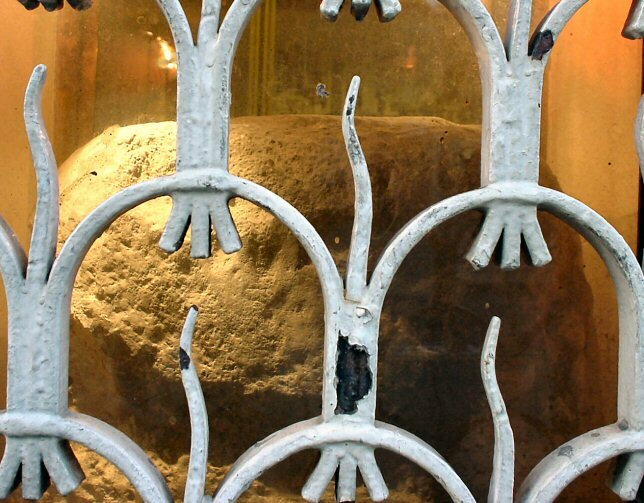 The London Stone is of deep and unknown antiquity, possibly as old as London itself, and may have been part of a Roman building or the mile stone from where Romans measured distance all over Britain. You wouldn’t know it to walk past it today but the stone once occupied a place in the hearts of Londoners akin to how Scots feel about the Stone of Scone. The truth is lost, like so much of London’s history, in the mists of time. We shouldn’t feel too bad though: no-one knew what all the fuss was about when John Stow was writing about London at the end of the sixteenth century. I don’t know why the centre for measuring distance shifted west from the Stone to the Cross. At a guess, at some point an official designation had to be made for government administrative purposes and Charing Cross was chosen as it was near to both King and Parliament, rather than continuing with an ancient convention for its own sake. If anyone knows I’d love to know. Other countries have interesting marks as their centre. Paris, and France, has Notre Dame Cathedral as Kilometre Zero, while the zero milestone in the United States is close to the White House in Washington DC. Rome goes for the top of Capitoline Hill. What’s the centre of your town? If you haven’t been to Eritrea then you’re not alone – but you are missing out. The tiny Horn of Africa state hasn’t been a country for very long. It gained independence from Ethiopia, after a protracted insurgency, in 1991, cutting its former landlord off from the Red Sea in the process. The few visitors who have ventured to this remote corner of Africa are tempted by tales of Asmara, the country’s enigmatic capital. 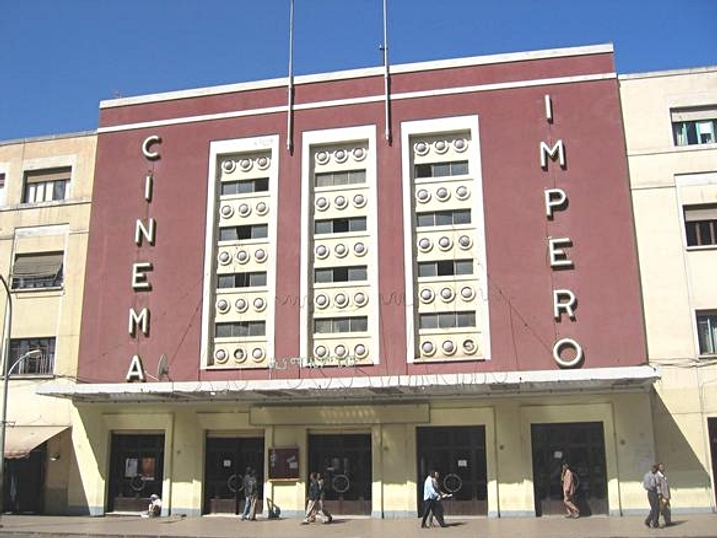 The Italian occupation of Eritrea from 1890 to 1941 left behind a rich and astonishingly complete legacy of Modernist architecture. If you can’t get there Edward Denison’s Asmara: Africa’s Secret Modernist City is a wonderful compendium of the wonders that await. It’ll probably make you go, by the way. That’s no bad thing. There’s more to Eritrea than this, including excellent diving and vague archaeological sites you can have all to yourself, but Asmara was what drew me here. After a day or so of strolling around laid-back streets, sipping macchiatos in old-school cafes on Harnet Avenue and joining Asmarinos on their nightly passegiata peregrination around the city I was ready to explore further. There was another reason: I fell over in Cinema Impero while trying to make my way in pitch blackness to a seat. Two vintage Modernist seats gave way. It was time to leave town before I broke anything else. There are two options for getting to the coast at Massawa, a bombed-out Zanzibar with a similarly timeless atmosphere. One is to club together with a load of railway enthusiasts and charter a train. The more usual one is to hop on a minibus which gets loaded with people, shopping and the odd goat for the seventy mile, 2000m descent to the coast. It wasn’t always like this though. 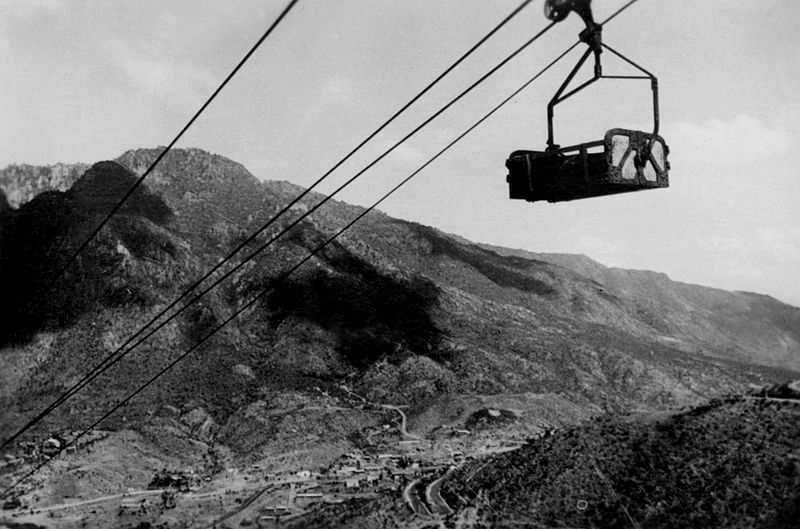 One other legacy of colonial rule was one of the most unusual forms of transport: the cable-car system known as the Teleferica Massaua-Asmara. This strange and very long system of cables, way-stations and goods carts was the fastest way to shift goods from the port to capital, and as you can see from this photo the odd passenger snuck on board. The system was dismantled by British administrators of the area when the Italians w ere overwhelmed in 1941 but some traces do remain. On the journey from Asmara to Massawa the road plunges through hairpin after hairpin, and if you can take your eyes off the road which is much easier going up than down you start to notice huge concrete blocks dotted along the route, These are the bases for the pylons that carried the cable way. Have a look at the Trainweb link at your leaisure. It is another rich source of information, reproducing a brochure produced at the time lauding the cableway, and gives you a good idea of how different the landscape would have looked with this audacious creation in operation. This picture’s caption notes that it was taken, by John Brantley, while stationed in Eritrea at the Kagnew station in the 1940s. It’s a Wikimedia Commons image and I am indebted to him for posting it. There have been, astonishingly, other cableways of similar long lengths. The COMILOG cableway ran between Gabon and the Republic of Congo for nearly fifty miles between 1959 and 1986. There’s fun to be had around the web finding out more. You should visit Eritrea but you may not wish to rush. Power cuts and shortages marked my visit and those who have been more recently suggest that travel permits are widely required. It is a beautiful and friendly country but not without troubles. I didn’t do it for you by Michala Wrong is a vivid and readable history. Cableways are cool and Eritrea is a unique place.